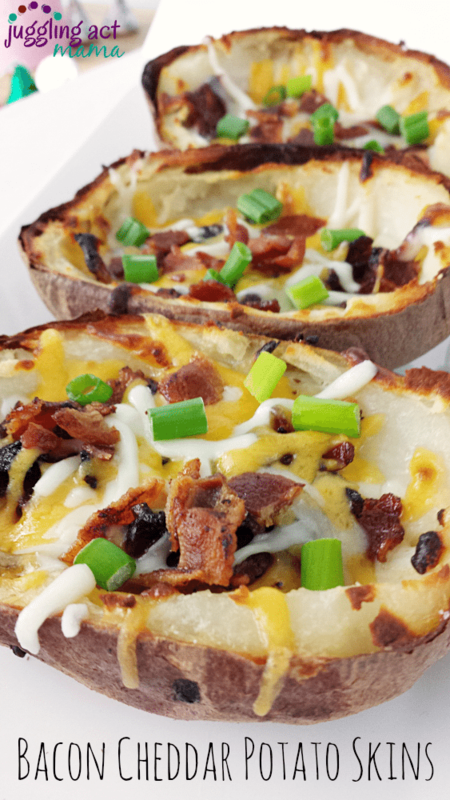 Who doesn’t love a good potato skin? 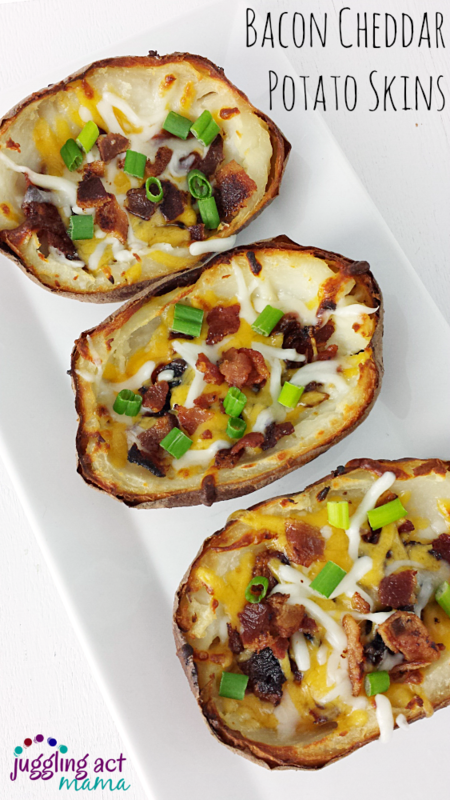 I mean, what’s not to love about the starchy, salty, cheesy combination? 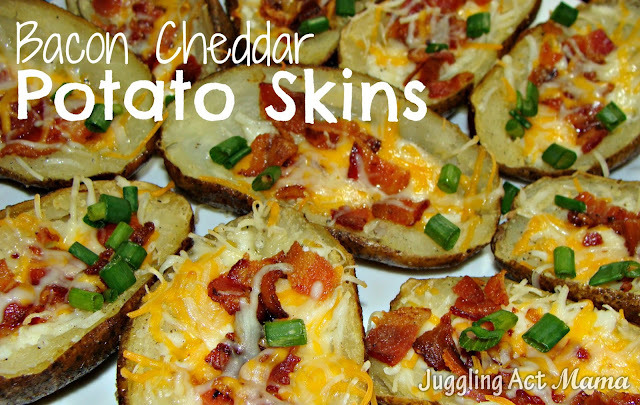 And they’re just the ultimate snack food for watching football, of course. Preheat the oven to 400-degrees. Scrub the potatoes and pat them dry. Rub the skins with olive oil. Bake the potatoes for about an hour. 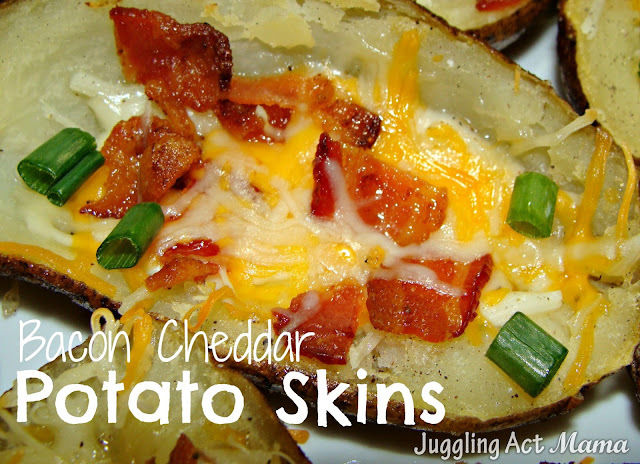 While the potatoes cook, dice the bacon and fry it until crisp. (I find that it gets crispiest when you're frying small pieces, rather than the slices). Remove the bacon pieces to a paper-towel lined place and set aside. When the potatoes are ready, remove them from the oven and let them cool so that you're able t handle them. Cup them in half the long way, and scoop out all but about a quarter inch of the potato. 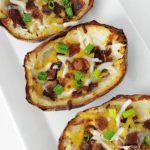 Arrange the potato halves on a broiler pan. Turn your oven up to 450-degrees and cook the skins for 20 minutes, turning the skins over halfway through. Now for the fun part - lightly salt the skins (to your taste), add the cheese and bacon and return to the oven to broil for about 2 minutes. Garnish with the scallions and serve with a side of sour cream. my favorite section so far is the recipies! This look good.. Potatoes are my favorite. And I love bacon.